Spinothalamic Tract is a large ascending bundle of fibers in the ventral half of the lateral funiculus of the spinal cord, arising in the posterior horn at all levels of the cord and continuing into the brainstem. It is also known as the ventrolateral system or anterolateral system. It is a sensory pathway from the skin to the thalamus. From the ventral posterolateral nucleus in the thalamus, sensory information is relayed upward to the somatosensory cortex of the postcentral gyrus. In addition to the ventral and lateral spinothalamic tracts, a separate dorsolateral spinothalamic tract has also been described in the rat, cat, and macaque monkey. Relief of pain observed after dorsolateral cordotomy suggests this tract is also present in humans. 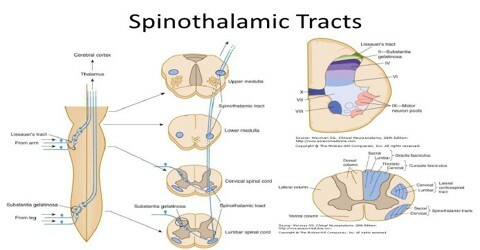 The ventral and lateral spinothalamic tracts ascend separately in the spinal cord intermingled with the spinomesencephalic, spinoreticular, reticulospinal, and spinohypothalamic tracts. In the brainstem they merge to form the spinal lemniscus. In the spinal cord, the spinothalamic tract has somatotopic organization. This is the segmental organization of its cervical, thoracic, lumbar, and sacral components, which is arranged from most medial to most lateral respectively. 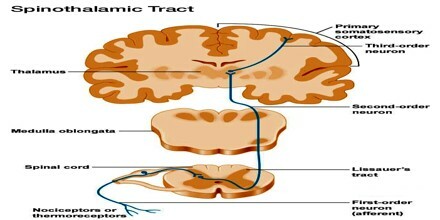 The anterior and lateral spinothalamic tracts. The former helps localize crude touch and pressure, the latter painful or temperature sensation. The spinoreticular tract, which is responsible for increasing our level of arousal/alertness in response to the pain or temperature. The fibres ascend from the muscles, joints and skin to synapse in the reticular formation. 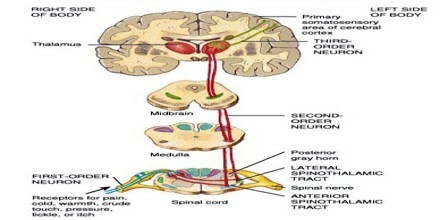 The spinotectal tract, which enables us to orient our eyes and move our head toward the relevant stimulus. The fibres ascend to synapse in the superior colliculi of the midbrain. Pseudounipolar neurons in the dorsal root ganglion have axons that lead from the skin into the dorsal spinal cord where they ascend or descend one or two vertebral levels via Lissauer’s tract and then synapse with secondary neurons in either the substantia gelatinosa of Rolando or the nucleus proprius. These secondary neurons are called tract cells.